Originally a camera shop, this unique structure (now a restaurant) is one of the city’s last remaining examples of programmatic architecture, in which a building physically resembles its purpose. 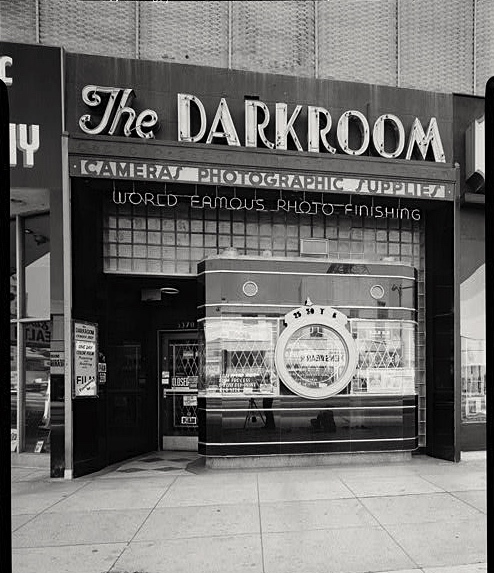 The façade’s nine-foot-tall Argus camera announced The Darkroom’s wares quite literally. Some claim that during the building’s heyday, the tenant would project short films through the camera lens/window for pedestrians to watch. Although earlier examples exist, such as the planned but never completed Elephant of the Bastille, generally the style became popular in the United States and spread to the rest of the world as travel by automobile increased in the 1930s. The Statue of Liberty in New York is a replica building that is part sculpture and part monument, which like many subsequent examples of novelty architecture, has an accessible interior and became a tourist attraction. Constructing novelty architecture near to roads became one way of attracting motorists to a diner, coffee shop, or roadside attraction, so buildings were constructed in an unusual shape, especially the shape of the things sold there. “Mimic” architecture became a trend, and many roadside coffee shops were built in the shape of giant coffee pots; hot dog stands were built in the shape of giant hot dogs; and fruit stands were built in the shape of oranges or other fruit. Tail o’ the Pup [is] a hot dog-shaped hot dog stand; Brown Derby is a derby-shaped restaurant; Bondurant’s Pharmacy is a mortar-and-pestle pharmacy; the Big Apple Restaurant … and the Big Duck are respectively a tall apple and a (now defunct) poultry store shaped like a duck. 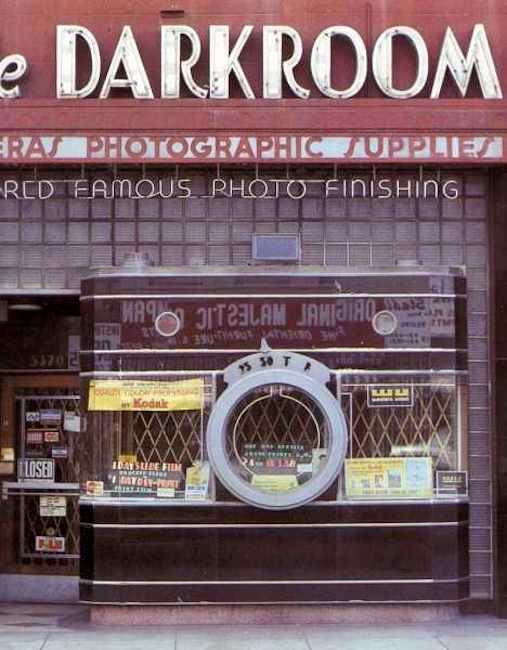 Novelty or programmatic (mimetic) architecture may take the form of objects not normally associated with buildings, such as characters, animals, people or household objects. Lucy the Elephant and The Longaberger Company‘s head office are examples. There may be an element of caricature or a cartoon associated with the architecture. Such giant animals, fruits and vegetables, or replicas of famous buildings often serve as attractions themselves. Some are simply unusual shapes or constructed of unusual materials. Bill Griffith is much taken with novelty architecture, and I’ve posted a number of times about Big or Giant X structures, mostly inspired by Zippy strips. The third item on this list was clearly what I was looking for. Bingo. 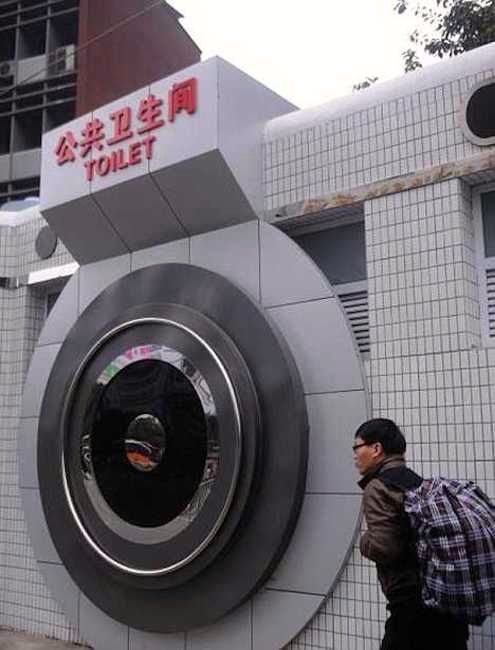 Why the city of Chongqing chose to build a public toilet in the shape of a camera I do not know. This entry was posted on August 17, 2017 at 4:38 am and is filed under Architecture, Art, Linguistics in the comics, Photography. You can follow any responses to this entry through the RSS 2.0 feed. You can leave a response, or trackback from your own site.